Flowers? For me? Why Gregor, you shouldn’t have. Gregor (born Johann) Mendel was a Czech monk who lived in a monastery with famously good beer. Having perhaps sampled too much of his institution’s brew, he became obsessed with understanding how traits are passed from parent to offspring. You probably remember his peas from biology class, possibly in the context of some sort of hateful grid structure with upper and lowercase letters all over it–the Punnett square. Amazingly, his dedicated tinkering with round, wrinkled, yellow, green, axial, medial, short, and tall pea plants led to such clear and profound insight about how inheritance works that he became the father of modern genetics. We owe most of our current language about inheritance (dominant, recessive, P and F for generations, etc) to his work. 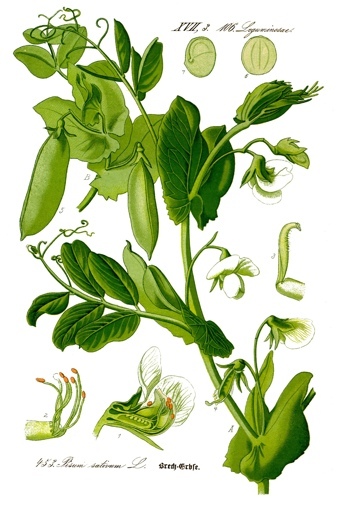 The surprisingly informative pea, Pisum sativum. Painting by Otto Wilhelm; digitization from Wikimedia common. It’s humbling to think he did this in the 1860’s–long before DNA was even known to be the material that housed genetic information, or what chromosomes were for, and close to a century before Watson, Crick and Rosalind Franklin worked out the structure of DNA. Although Mendel is famous for his work on peas, he worked with equal diligence (but probably considerably more frustration) on bees, which have a complicated genetic architecture: some bees have two sets of chromosomes (one from each parent, making a diploid organism, just like humans), but some have only one set (haploid, inheriting genetic material only from their mother). Baffling. What’s more, all this inheritance work was basically just a side project; most of his publications were on astronomy, and he founded the Austrian meteorological society in 1865, one year before his paper on plant hybridization was published. Mendel’s 1st law (the law of segregation): the two alleles for a trait separate during gamete formation and unite at random, one from each parent, at fertilization. This law ensures that an offspring inherits one copy of each gene (allele=copy or version of gene) from each parent, and then when that organism makes gametes (sperm or eggs) of its own, the two copies it inherited will separate from each other so that each sperm or egg gets only one copy, chosen at random. Mendel’s 2nd law (the law of independent assortment): during gamete formation, different pairs of alleles (genes) segregate independently of each other. That is, if you have one gene that governs one trait, like seed color, and another gene that governs another trait, like flower position, those genes are inherited separately, with shuffling during egg and sperm formation. This is an oversimplification, since Mendel didn’t know about linkage, but it’s generally true. Being a bit enamored of both plants and genetics myself, Mendel seemed like an appropriate patron saint for my little blog. Of course, I could have gone with Darwin, since most of the things that make all the plants on here so cool came about because they conferred some selective advantage upon the plant…or Linnaeus, since he came up with the binomical Latin taxonomic nomenclature that’s littered all over here, but meh. I picked old Gregor and I’m standing by him. Thanks much! I like yours too–you make some beautiful stuff! Yes: I’m pretty adventurous about my foraging, but draw the line at plants with deadly dopplegangers. On the other hand, to someone who’s very familiar with wild carrot, it probably seems as safe and unmistakeable as I feel with hemlock’s other relative, fennel. I suppose it’s all a matter of perspective.